African violets are very delicate and can be difficult to grow, but they’re beautiful enough that they’re well worth the effort. Knowing the best process for getting a new plant started is definitely half the battle. You’ll read about the entire process here, as well as an interesting tip that will make your violet blossoms bigger and more vibrant. 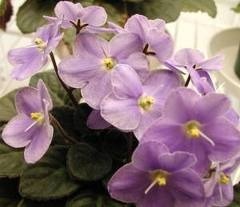 Break a full leaf off of a mature African violet plant. Try to snap the leaf’s stem as close to the body of the plant as you can. Fill a drinking glass almost all of the way to the brim with room temperature tap water. Cover the top of the glass with a piece of aluminum foil. Make a small slit in the middle of the foil with a sharp knife. Slide the stem of the removed leaf through the slit in the foil so that the stem is mostly beneath the water level. Set the glass in a sunny area and watch it closely over the next several days. After a few days, when a substantial network of roots has developed, you can transfer it to a pot. Fill a very small planting pot with potting soil and set it in a matching water tray. Make a small hole in the center of the soil with your finger. Carefully tear the aluminum foil so that it can be slipped off of the leaf without damaging the roots. Gently place the root end of the leaf in the hole you made in the soil. Lightly cover the roots with soil. Water the plant by pouring a small amount of water into the water tray, but not directly into the soil. Place the pot in a cool, sunny area. Water it once every week by pouring the water into the water tray. When the plant has taken shape after a couple of weeks, push a few rusty nails into the soil. The iron from the rust particles will enrich the soil with nutrients that African violets love, and the blooms will be much larger and more colorful than they would otherwise. If you don’t have any rusty nails, you can buy iron supplements at just about any nursery. But rusty nails work just as well and they’re free where you can find them. Once the plant starts growing, you can remove the starter leaf if it is making the stem grow in crooked. Handling rusty nails is dangerous. Don’t do it if you’re not protected by tetanus immunizations. If you cut yourself on one, seek a doctor.